Bearing Away is a unique multi-sensory phonics programme for children with more complex learning difficulties. It is designed for pupils who are struggling to make a start in learning to read—pupils who cannot even remember single letter sounds. 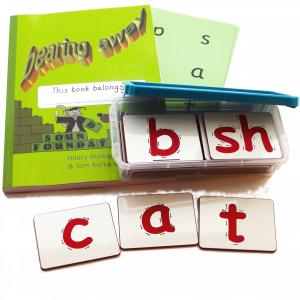 It combines elements from the earliest stages of our reading and spelling programmes with our distinctive engraved letter tiles. Letter and sound recognition, correct letter formation, blending and segmenting are taught in tiny incremental steps with an extraordinary amount of structured overlearning. Constantly changing multi-sensory exercises ensure that it never gets boring. Regular in-built Mastery Tests ensure that pupils are always working at the right level and that newly-learned skills are not forgotten. It should be used for 10 minutes every school day. When pupils have completed Bearing Away, they will be able to read and spell simple CVC words, and they will know the digraphs ‘sh’, ‘ee’ and ‘ar’. They will then be ready to start on our normal programmes, Bear Necessities and Apples and Pears. The instructions for teachers are included in the workbook and printed up-side-down at the top of each page. You must sit opposite your pupil when you are using Bearing Away. You need to be able to see when they are confused or losing focus, so you can step in right away and show them what to do before they make an error and lose confidence. The Starter Pack comprises one copy of Bearing Away and a set of 28 multi-sensory engraved plastic tiles in a box. You will need one Starter Pack per school and one copy of Bearing Away for each additional pupil. To replace lost tiles. Five copies of Bearing Away for the price of four.